After the messy mess that was Batman v Superman last week, I've found myself thinking about Big Hero 6 a lot. It might seem like a nonsequitor, but as I was contemplating the ways that Batman v Superman really screwed up a lot of our conceptions of heroism and masculinity, I realized that in a lot of ways, Big Hero 6 is its direct antidote. Because if there's any movie that directly contradicts the idea that the best way to be a hero is to punch harder and insist on your own rightness it's Big Hero 6. So to get the taste of overbaked testosterone out of our mouths, today we're going to look at an interpretation of heroic masculinity that I am much more comfortable recommending. 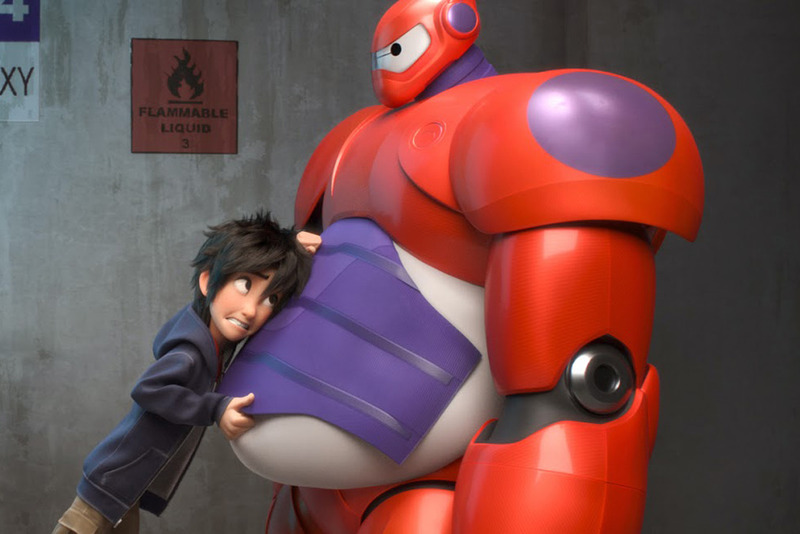 Big Hero 6, Baymax, and a masculinity that's about using strength to help, not harm. So if you're not familiar or if time has washed away your memory of this movie, Big Hero 6 is a fantastic little piece of film from Disney Animation - the same people who brought you Zootopia and Wreck-It Ralph. We like them. I mean, I'm not huge on Frozen, but overall I think they've got a solid track record. The movie is based incredibly loosely on a superhero manga, but it diverges enough from the source material to make it really not worth examining in that light. The basic plot of the film is this: Hiro Hamada (Ryan Potter) is a fourteen year old genius inventor who spends his days skipping class and entering in illegal robot streetfights. His older brother, Tadashi (Daniel Henney), feels like Hiro is wasting his potential and decides to encourage him to enter the robotics program at their local university. Tadashi and his friends - who are all cool and brilliant and wonderful - successfully sell Hiro on the values of getting into a program like this, but he still needs a standout project, something to catch everyone's eye and get him in. 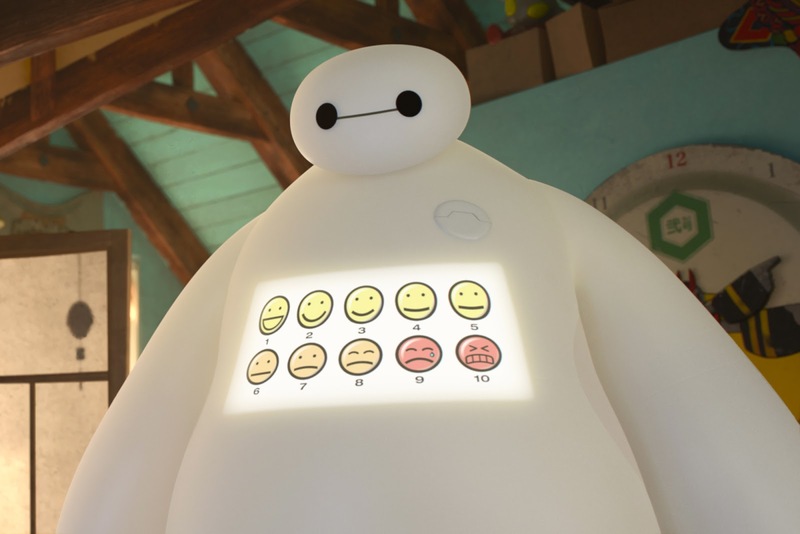 Tadashi's project, his life's work so far, is a robot called Baymax (Scott Adsit), a "personal healthcare companion". Programmed with an extensive understanding of anatomy, biology, and medicine, Baymax is a warm, huggable balloon that's capable of dispensing bandaids and diagnosing complex medical issues. He's great. I say he because, as the film makes clear, Baymax is (sort of) a boy. We'll get to that more later. Anyway, Hiro comes up with a brilliant idea for his intro-project, a group of nanobots that function using a neural relay - the person wearing a fancy neural headband can control these nanobots and use them to make complex buildings, transportation, anything really. They're super cool. But all this coolness comes to a halt when the convention center where Hiro is displaying his nanobots catches fire - he and Tadashi run for safety, but Tadashi's professor, Robert Callaghan (James Cromwell), is still inside. Tadashi goes in after his professor and doesn't come back out. Understandably this scuppers Hiro's immediate plans about college and puts him in a deep depressive state. It's not until he accidentally wakes up Baymax one day that he starts to really live again, discovering that his nanobots weren't destroyed in the fire and are being used for nefarious purposes. Hiro goes off on a quest to stop whoever stole his nanobots, avenge Tadashi's death, and become a superhero. His friends, including Baymax, go along with him. But the key part here is that while Hiro's original goal is to avenge Tadashi's death, this isn't a heroic aim. Hiro has to learn that Tadashi's sacrifice isn't something that needs vengeance. Moreover, a hero should not operate out of a desire to punish people, but out of a want to help people. Positive motivations versus negative ones. This most clearly comes out in how the narrative treats Baymax, showing Hiro's desire for vengeance transform this sweet and cuddly robot into a fighting machine and how wrong that really is. The idea is that pursuing violence and anger can turn you into something you're not. Implicitly, however, this plot point shows how toxic masculinity and ideals can destroy something beautiful that doesn't fit within traditionally masculine ideals. In a weird way, this movie is actually about how our definition of what is and is not masculine needs to expand. That's where we come in today. 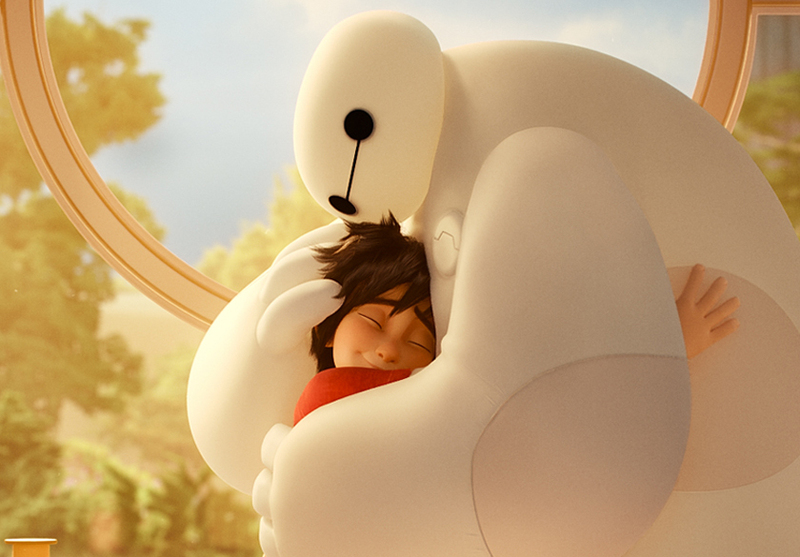 So, Baymax is established from the start as being a non-threatening, huggable, lovely creature. He's a robot, sure, but he's somehow a robot that you really want to cuddle up with. Mostly because he's inflatable. But his design is explained to be very intentionally comforting, a soft squishy, albeit large, companion to keep you healthy and happy. And there's nothing wrong with that. Baymax is a happy, calm, loving character that happens to identify as male. Yay! The problem comes when Hiro, in his quest for vengeance, decides to weaponize this adorable ball of fluff. First he just figures that an inflatable Baymax is one that's going to get puncture holes a lot - which is a fair point - so he builds some armor for the robot. But then he adds in martial arts training, ostensibly to make Baymax better at defending him, and we see that what Hiro is really doing is fundamentally changing who Baymax is. He loads up the robot with kung fu movies and death kicks, gives him better armor, and seeks to unleash him on the world. At first this is fine. Baymax is primarily defensive, and even his armor still keeps his general shape. He's just like BaymaxPlus. He's stronger and better at fighting and can keep Hiro safe when they go running after evil masterminds. It's still not enough for Hiro. He gives Baymax more fight moves, makes him more masculine armor, and keeps trying to turn Baymax into a fighting robot. 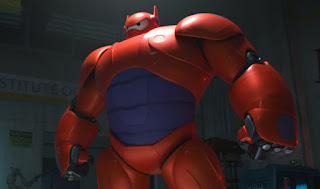 It's most noticeable when Baymax finally puts on the new armor: instead of his former cuddly shape, with a big belly and soft arms, Baymax has been pushed into a form that mimics that of a pro-bodybuilder. He has a big broad chest, small stomach, and huge shoulders. He looks like the masculine ideal, but we know that underneath, without that armor, he's still Baymax. He's still a cuddly blob. So when we look at him in the armor, or at least when I do, it feels wrong. Weird. Uncomfortable. It gets worse. During a confrontation with the villain that Hiro is sure started the fire that killed Tadashi, Hiro removes Baymax's healthcare chip altogether, leaving him with just the violence center, an unhinged killing machine that is completely different and horrifying. He's a perversion of who Baymax is supposed to be, and we all know it. Even when Hiro gets the chip back into Baymax and stops his rampage, we're frightened. Baymax has been destroyed, effectively, turned into something he isn't. Baymax without all the things that make him Baymax is an abomination. Or, well, he's a modern superhero. See, the thing that makes all of this brilliant is how slow and subtle it is. Baymax is a soft, cuddly, loving protector who is slowly turned into a deadly killing machine by circumstances outside of his control. Isn't that the narrative of any number of superhero movies? It's a brilliant commentary on our cultural obsession with violence at the expense of goodness and earnest sweetness. It's a clear demonstration of the idea that we seem to think no one can be heroic and also kind. That no one can be strong and also soft. What makes this more than just a depressing look at American culture, though, is how the film turns from here. Instead of leaving Baymax a horrifying monster and sort of going, "Yeah, but he's a really good fighter now! ", Baymax gets his chip back and is genuinely really upset about what happened. Hiro has to apologize and reconcile with Baymax, coming to understand that Baymax is defined by his ability to care. He's not a killing machine - to make him into something he's not is to destroy him. This is also when we establish why Baymax is a male character - the chip inside him that makes him care and want to save people is basically a download of Tadashi. Baymax's identity comes directly from Tadashi's idealism and love for humanity and more than a little of Tadashi's personality. Baymax is male, but he's never supposed to be the kind of masculine that styles itself on fight movies and revenge plots. He's a caregiver. The movie's recognition of this and acceptance of it turns the narrative into a critique of toxic masculinity. If we think of toxic masculinity as a masculine ideal that focuses on strength as power and how physical ability and physical violence are the signs of a strong man, then Baymax's transformation into and out of this ideal is really powerful. Baymax starts out as a character who does not fit this masculine ideal. Then he slowly transforms into someone who does, but it's horrifying. It's only when Baymax is allowed to be his authentic, caring self that we see him fully express his strength and goodness. Under a toxic masculine ideal, Baymax can't be himself, and that's a very clear rebuke of this mindset. Ultimately, I don't know if this was an intentional storyline in the film, but I do know that I appreciated it a lot. Baymax is important in a lot of ways because he is identified as a male character. He's a robot designed to care for others, to put others first. And in his most powerful form, when he's been enabled to defend those he loves but also to acre for their physical and emotional needs, he is able to literally save the city and to sacrifice himself. Being allowed to care doesn't make Baymax less, it only makes him more. 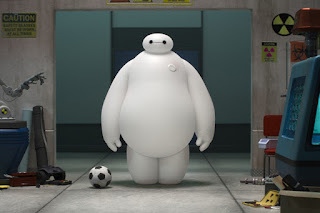 We need more male characters like Baymax, in kids movies and also in adult superhero flicks. We need male superheroes who heal, who love, who give really good hugs and who refuse to become something they're not. Not everything has to be grimdark all the time, but right now the only mainstream male superhero I can think of who would be at all comparable to Baymax is Barry Allen on The Flash. And that's a stretch. If we want to create a world where men are allowed to be anything, where men are valued for their empathy and kindness just as much as for their courage and valor, we need more heroes like Baymax. We need to look at movies and see characters who love well. We need to see characters who are strongest when they sacrifice and best when they are soft and gentle and warm. If anything's going to balance out the Batman v Superman level macho in our culture, it should be this. I think it's actually telling and pretty wonderful that when Big Hero 6 came out, all anyone wanted was a Baymax plushie. Why? Because it presented this idea of a hero who you could hug. A hero who was non-confrontation, non-threatening, and still powerful and good. It completely shifted the idea of what could be heroic. Baymax never needed to fight to be a hero. He was one as soon as he saw a friend in need and gave him a hug. I think that's something we'd all do well to remember. Also Scott McCall, to an extent. I mean, it's arguable if you could call him a superhero, but he is definitely cuddly and caring. Love this post! I had never thought of the movie in this light, but I really do appreciate this aspect of it.